This bright and colorful quilt is easy to make and looks great on the wall or wrapped around a baby. Great idea for using up those well-loved scrap pieces of fabric you've been saving. 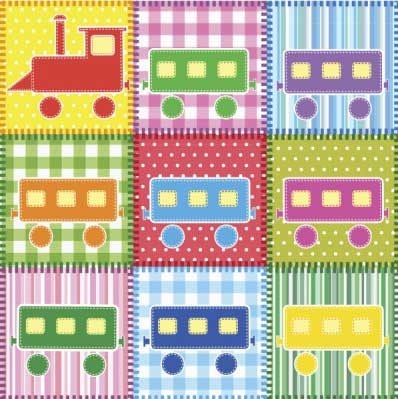 Here is a quilt pattern for a train engine and it's cars. By making the top of the quilt out of cotton and the bottom from flannel, you have a quilt that is soft and cozy. Add to the decor of a nursery by choosing colors and prints that match with the room's color scheme. Give a gift from the heart by sewing a warm and cuddly quilt for little boys or a baby.